I have started toying with the idea of building a unique cart system for WordPress. Most that I have come across have custom post types for products, massive amounts of configurations and requires some coding integration. What I’m planning on doing is making it completely shortcode based. To you create a product by simple defining a shortcode in a post or page. that shortcode then becomes an add to cart button with all the info like sku, price etc embedded. Theres probably a lot of thinking still, but I think its a good start to something fun. The snap here is of the widget cart summary. 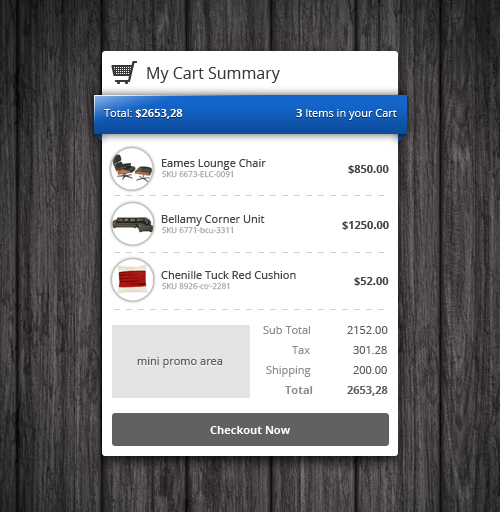 It will be a live widget that registers add to cart clicks. and adjusts as needed. Also i want the design to be set. so its not wrapped in the themes styles. there will be color choices though.